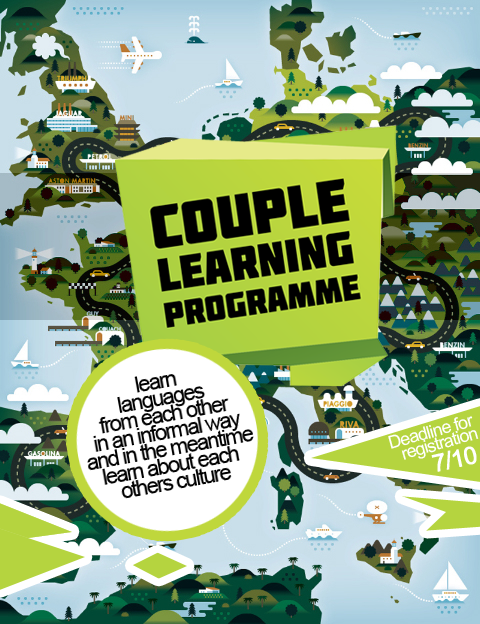 Couple Learning Programme is a cycle of events, created by students, for STUDENTS. Program’s purpose is to help learn LANGUAGES from each other in an INFORMAL way and in the meantime, learn about each other’s CULTURE. How does that work? Participants are divided in pairs where one is a Latvian student, and another is a foreign languages student. By meeting up from time to time as well as by fulfilling the tasks, given by organizers, they are learning new languages and, at the same time, gaining knowledge and experiencing a new culture. Program is 3 months long for you to get the most of it. Deadline for the registration is on 7th of October. And most of all… It’s fun! Event is organized by students’ councils of 3 major universities – University of Latvia, Riga Technical University and Riga Stradiņš University. Every semester up to 200 students come together to participate in CLP. Be one of them! This entry was posted on Septembris 30, 2013 by Madara in Iespējas and tagged Couple Learning Programme.